It was Netaji’s dream of hoisting the Tricolor in Red Fort. PM Modi fulfilled this dream. 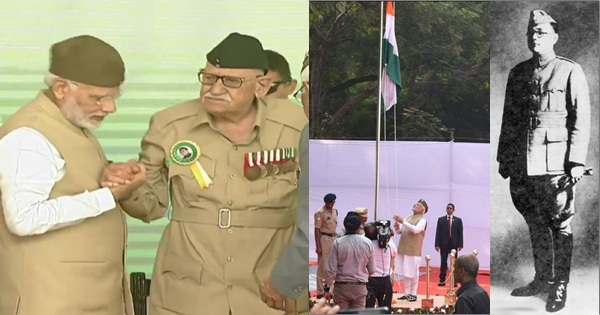 On the 75th anniversary of the Azad Hind Govt., PM Modi hoisted the Tricolor in Red Fort in the presence of Azad Hind Fauz living legend Shri Lalti Ram, Netaji’s grandnephew Chandra Kumar Bose, and other dignitaries amid applause from hundreds of Netaji fans. 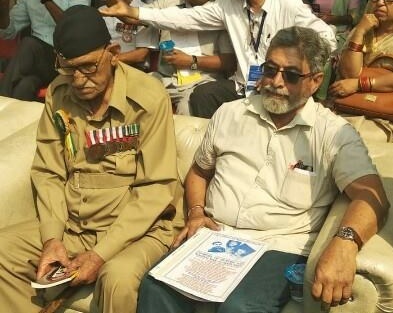 Presence of INA veteran Shri Lalti Ram is symbolic of the presence of Netaji Bose and the 60,000 plus INA soldiers, out of which 26,000 attained martyrdom in action against British. Netaji Bose established the Provisional Government of Free India, i.e. Azad Hind Govt. in Singapore on 21 October 1943. Its army was the Azad Hind Fauj. He allied with the Axis powers and his cause was funded by Imperial Japan monetarily, militarily and politically. It was recognized by 11 countries including Russia. With Japan’s support, the Provisional Government of Free India had nominal authority of the Andaman and Nicobar Islands including parts of Manipur and Nagaland. And Azad Hind declared war against the Anglo-American allied forces on the Indo-Burma Front. 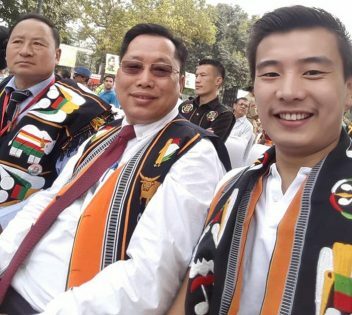 They charged against the British forces in the Imphal-Kohima sector. After defeating the British defences in Kohima, they advanced further towards Moirang. From here they had to retreat owing to compromised supply lines and withdrawal of Japanese forces. 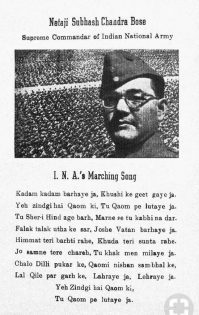 Listen to what Netaji Bose's bodyguard Shri Jagram say about the 'Chalo Dilli' march from Singapore to Red Fort. Shri Jagram had two shorts during his INA service. He was wearing an old short that had 17 repair stitches when Netaji asked him if he had any other short to wear. Shri Jagram replied that the other one was new and that he would wear it in Red Fort after the 'Chalo Dilli' ends. Here is the full video: https://youtu.be/UIC9jyacWSM of the interview that we took on behalf of myindiamyglory.comNetaji Bose established the Provisional Government of Free India (Azad Hind Govt) in Singapore on 21 October 1943. It was recognized by 11 countries. ‘Chalo Dilli’ was the 'INA nara', the slogan that resounded amongst the INA soldiers. And this was the slogan when they marched towards the Northeast and defeated the British forces. Tomorrow is the 75th anniversary of the establishment of the Azad Hind govt. Maj Gen Gagandeep Bakshi supported by various organizations and Netaji fans are organizing a Chalo Dilli rally in New Delhi at India Gate. PM Modi will hoist the tricolor at Red Fort. There will be an assembly at Vijay Chowk at 9.35 am. This will be followed by honoring of INA veterans. 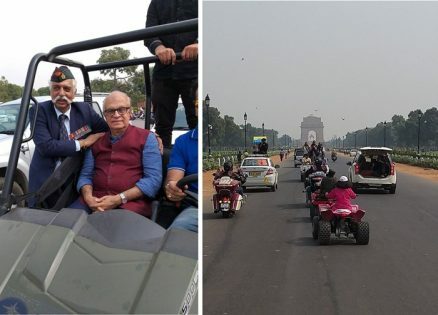 The INA veterans will be brought with due honor on Polaris all Terrain Vehicles from Vijaypath to lawn of India Gate. The lead vehicle will have the Photo of Netaji. The INA veterans will follow one in each ATV. This cavalcade will be led by a thundering contingent of 30 Indian Motorcycles which are Bigger than Harley Davidsons.Please come and be a part of the Chalo Dilli Rally tomorrow. 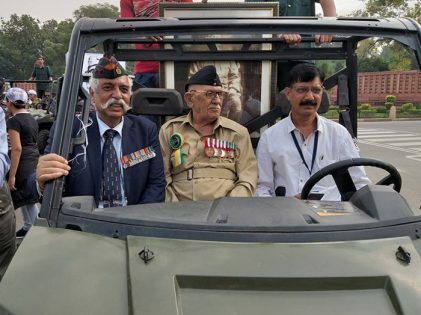 Meet the INA veterans and listen to Maj Gen GD Bakshi, Subramanium Swamy, Rajiv Malhotra, and other dignitaries speak at the ground behind Vigyan Bhawan, New Delhi. It was at the Red Fort that the INA trials were held. The British chose Red Fort as the venue for the trials because they came to know about Netaji’s ‘Chalo Dilli’ war campaign and his plans of hoisting the tricolor at Red Fort. Hence, to insult Netaji and the INA, the British found no place suitable for the trials other than Red Fort. In between November 1945 and May 1946, the British held 10 court-martial trials of soldiers of the INA at Red Fort. Hence, it is also known as the Red Fort trials. A number of officers of the Azad Hind Fauz were considered guilty. Most of the soldiers who were tried were British prisoners of War who joined Netaji’s INA. The joint court-martial of Colonel Prem Sahgal, Colonel Gurbaksh Singh Dhillon, and Major General Shah Nawaz Khan, who were officers in the British Indian Army and taken as prisoners of war, and who joined the INA, drew sympathy from Indian soldiers posted in the British Army. The British charged them for ‘waging war against the King-Emperor’. There was huge outcry and unrest amid the Indian troops. The outrage led the British reduce the charges against the guilty. But the INA trials ultimately led the British leave India. Commemorating the 75th anniversary of Azad Hind government, PM Modi said, “Netaji had promised an India where everyone has equal rights and equal opportunities. He had promised a prosperous nation which was proud of its traditions, development in all areas. He had promised to uproot ‘divide and rule’. Even after so many years those dreams remain unfulfilled.” At the same time, he criticised the Congress and alleged that the contribution of leaders like Netaji Subhas Chandra Bose have been “obliterated” in mainstream Indian discourse to “magnify the presence of one family”. 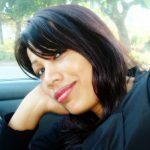 To quote India Today – Modi said: “It has been our misfortune that even after independence, those who laid the foundation of India and our system, looked at India from an English spectacle. Our heritage, culture, education system, our curriculum have all suffered from this. Members of the Azad Hind Fauj fought valiantly for India’s freedom. We will always be grateful to them for their courage. The 75th anniversary celebrations of the Azad Hind Govt. took place at three locations: 1)Red Fort, 2)Rally on Rajpath from Vijay Chowk to Vigyan Bhawan Grounds near India Gate and 3) Function and Celebrations at Vigyan Bhawan grounds near India Gate. 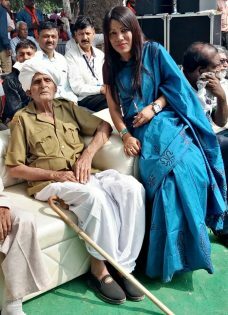 The event was organized and spearheaded by Major Gen GD Bakshi with support of Veterans India, Warrappa Foundation and other associations including Netaji fans. The event kick-started days ahead in several cities and the final ‘Chalo Dilli’ march for Netaji took place on 21 Oct in New Delhi. Honoring Netaji Bose and INA veterans…the rally with slogans of Netaji and Bharat Mata Ki Jai filling the air. 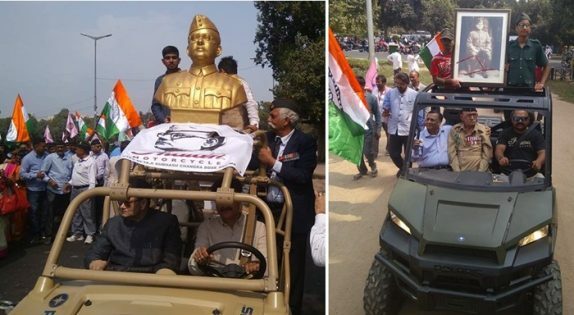 Statue of Netaji and INA veterans brought on Polaris vehicles escorted by motorbikers through Raj Path to Vigyan Bhawan grounds near India Gate. 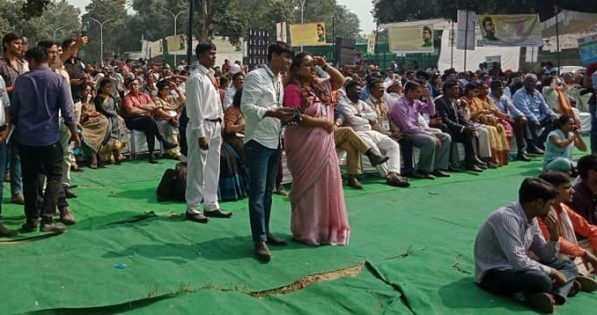 Netaji fans from across the country were part of the celebrations of the 75th anniversary of the Azad Hind govt. Among the visitors were a team from Nagaland, especially from Ruzazho Village. Netaji Subhas Chandra Bose had appointed Shri Poswuyi Swuro DB as the 1st Administrator of the Azad Hind Govt. at Ruzazho village in Nagaland in 1944. Bose stayed at Ruzazho village for 9 days during this period. Netaji Bose also appointed 10 Gaon Burhas (Village Chiefs) during the same time. Poswuyi Swuro is 98 years old at present. One of the toughest Battles during Second World War was fought in the year 1944 between the two colonial empires Viz. British and Japan at Kohima in the heart of Naga soil also known as, “The Battle of Kohima”. Shri Vekho Swuro, son of Poswuyi Swuro, was also present in the 75th anniversary celebrations of the Azad Hind Govt. Vekho Swuro (middle), son of Shri Poswuyi Swuro DB, who was the 1st Administrator of the Azad Hind Govt. appointed by Netaji Bose at Ruzazho village in Nagaland in 1944. 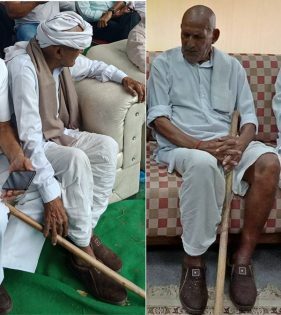 Three INA veterans graced the occasion – Sri Lalti Ram, Shri Bhagmal, and Shri Hira Singh, all nearing 100 years of age. Amongst the speakers and dignitaries present in the event were Maj Gen GD Bakshi, Chandra Kumar Bose, Rajeev Malhotra, Dr. Kapil Kumar, Dr. Kapil Kumar, Suresh Chavhanke of Sudarshan channel, Mr Satpathy from Orissa, Sarvjit Dhillon (son of INA Colonel Gurbaksh Singh Dhillon, who underwent INA trials at Red Fort), Veteran BK Mishra, to name a few. All dignitaries spoke about contribution of Netaji in India’s freedom. Here’s the thundering speech of Maj Gen Gagandeep Bakshi at the 75th anniversary celebrations of the Azad Hind Govt. at Vigyan Bhawan grounds near India Gate. The thundering speech of Maj Gen Gagandeep Bakshi at the 75th anniversary celebrations of the Azad Hind Govt. at Vigyan Bhawan grounds near India Gate yesterday. These are only few examples of the brave sons and daughters of Bharat Mata who sacrificed everything and joined Netaji Bose’s INA. Unfortunately, neither Netaji Bose nor the 60,000 INA soldiers were recognized for their valor and sacrifice by the then Nehru government after independence. They aren’t recognized yet. Netaji fans at the 75th anniversary celebrations of Azad Hind Govt. Justice PB Chakraborthy wrote a letter to the publisher of RC Majumdar’s book, A History of Bengal. In this letter, the Chief Justice wrote, “When I was acting Governor, Lord Attlee, who had given us independence by withdrawing British rule from India, spent two days in the Governor’s palace at Calcutta during his tour of India. At that time I had a prolonged discussion with him regarding the real factors that had led the British to quit India. My direct question to Attlee was that since Gandhi’s Quit India movement had tapered off quite some time ago and in 1947 no such new compelling situation had arisen that would necessitate a hasty British departure, why did they had to leave? With PM Modi and the citizens of India, the sons and daughters of Bharat Mata, joining the march for the cause of Netaji Bose, the 75th anniversary celebrations of the Azad Hind Govt. turned out to be a huge success. Hope this spirit is kept alive every day, every year! Chalo Dilli!! Jai Hind!